phpBB • Custom Profiles within Main Profile for Roleplay Characters? Custom Profiles within Main Profile for Roleplay Characters? Hi! I had a brief search and couldn't find anything that does what I'm looking for. I'm part of a roleplay forum and we would love to be able to have custom profiles for our characters that include a picture/s and some info about them. 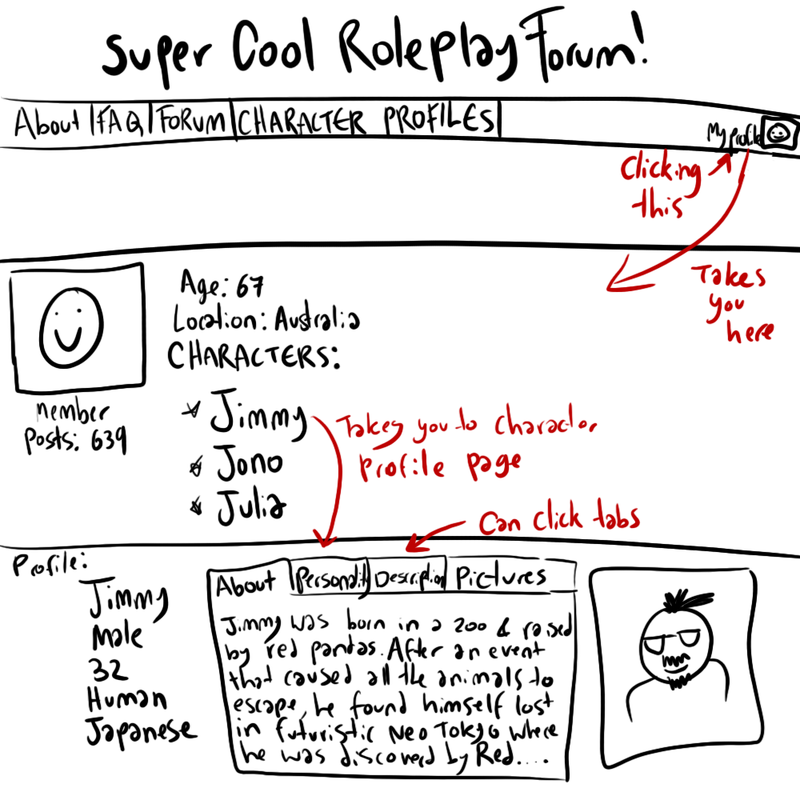 It would be fantastic if we could click on a users profile, and it lists all their rp characters, say Jimmy, Jono and Julia, and when you clicked on Jimmy's name it would then take us to his Profile. Some sort of search function, so that we could look at all the character profiles from the header would be great too. Re: Custom Profiles within Main Profile for Roleplay Characters? Huge project, but perfectly doable. Would be cool if anyone could create an ext for this. Yeah at the moment we are currently looking into using Mediawiki as a way to do this, but any other suggestions would be fantastic too. I don't think it has to be quite as complex as I've made it. For example the tabs are more for looks, could have it so each section is further down on the page. Looking at the first post generates only one question. Is character data already stored somewhere? I see, so info is/will be stored in db and by looking at some files, it seems that some info is already displayed on profile. Why not ask the author of that extension to modify something that is needed? That said, the extension that was linked above was last edited on github 2 years ago and I'm not sure if it would still work on phpbb. Not sure if the author is still active. That said, the extension that was linked above was last edited on github 2 years ago and I'm not sure if it would still work on phpbb. Installed on my test 3.2.4 board, and see no problems at the moment. Only a few language strings are missing. Those are not big problems and can be solved by rewriting from scratch or adjusting/modifying the existing code. As pointed above, it's a major project and needs some thought about a lot of things. Last edited by GanstaZ on Fri Nov 23, 2018 3:57 pm, edited 1 time in total. Make sure to delete the 3 bbcodes added and a column in the POSTS_TABLE after the delete data action. Ofcourse looks as abandoned and throws many errors here and there but it could be a good starting point for those interested, after a debug. Hadn't more time to lurk at the code itself, that's all.